Peter Watkins was born in Surrey, England in 1935. After education at Cambridge and the Royal Academy of Dramatic Art in London, he became an amateur documentary filmmaker, gaining some notoriety for shorts like The Diary of an Unknown Soldier (1959) and The Forgotten Faces (1961). In these films, Watkins initiated a challenge towards conventional cinematic norms that he has yet to relinquish. He was eventually hired by the BBC and with Culloden (1964) he established an innovative style combining drama played out by non-actors with newsreel techniques. Through bold montage, revealing close-ups, and hand-held camera movements, Watkins deconstructed both the historical myth surrounding the battle of Culloden and the cinematic conventions of traditional costume drama. Watkins employed the same techniques in his second docudrama for the BBC, The War Game (1966). Here, the effects of a nuclear strike on Britain are investigated in what Watkins has often referred to as the "You Are There" style. Realistic depictions of nuclear havoc are mixed with interviews with actors impersonating "survivors" and establishment figures whose rationalization look increasingly uncomfortable as the horror unfolds. The BBC decided to ban the film from television screening (it was finally shown in 1985) because of its disturbing content (and its outspoken anti-war sentiment). The film was allowed a limited theatrical release, however, and won a special prize at the Venice Film Festival (1966), an Oscar for Best Documentary Feature (1967), and a BAFTA film award (1967). Following the controversy regarding The War Game, Watkins' filmmaking career turned stormy. It became increasingly difficult for him to find work, and his films often met with underhanded attacks or widespread indifference. Despite this, he has managed to produce many remarkable and rigorous films, often with no assistance from national film or television agencies. 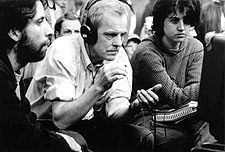 While Edvard Munch and The War Game remain his best known works to date, his recent films like LA COMMUNE (Paris, 1871) was hailed by J. Hoberman of The Village Voice as, "An intellectually challenging and tremendously moving experience, as history replayed among its contemporary ruins. LA COMMUNE is meant to evoke the unfamiliar sensation of revolutionary euphoria, or living (and dying) in a sacred time." He has continued his film-making career in Scandinavia, the U.S. and France. His sporadic cinematic output has been combined with fierce public attacks on the general media situation. Peter Watkins currently lives in Lithuania. La Commune (Paris, 1871) - The new film by Peter Watkins. A 5 hour 45 minute event. Based on a thorough historical research into the Paris Commune of 1871, this film leads to an inevitable reflection about the present.